Thanks to great response here and from Bill (G4WJS) I would like to share my working configuration for working WSPR Hopping mode on 5 bands with WSJT-X v1.7.0 and FlexRadio 6300. Since I have a GAP vertical tuned to each band (80m,40m,20m,17m,15m)no ATU is required. I was setting FlexRadio on USB but it was switching itself back to LSB after a USB band change was sent from the WSJT-X program. Setting FlexRadio to DIGU on all bands solved the mode switching problem along with setting mode to none in WSJT-X. Attached is the completed settings on my working station all in one photo. 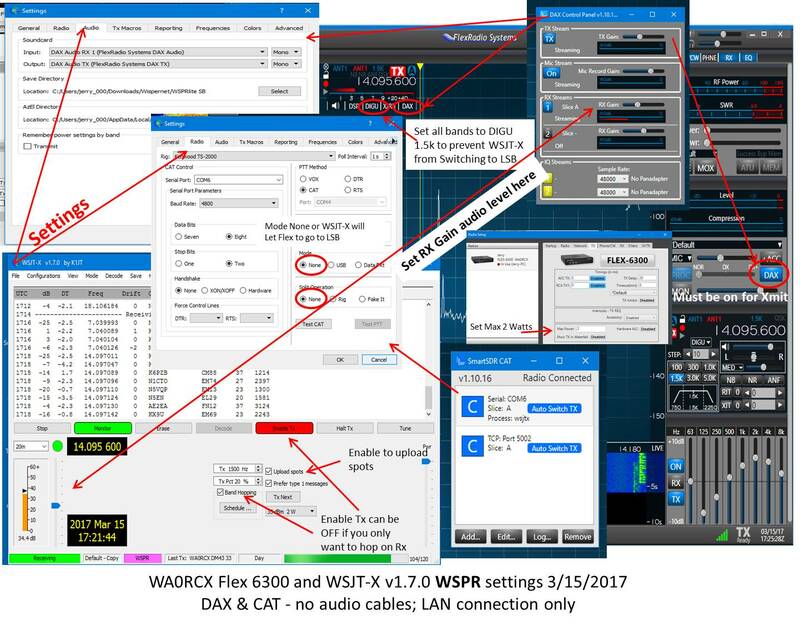 All is working with CAT and DAX no audio cables on LAN connections only.